You have decided to “tie the knot”. You have chosen a wedding date. You picked out the perfect wedding dress. But now you are faced with the daunting task of finding someone to marry you. In today’s society it is becoming increasingly popular for young couples to get married outside of the traditional brick & mortar church. In addition to wedding receptions, many of the banquet halls in the Pittsburgh area also offer you the ability to hold your wedding ceremony at their location. Several halls such as Greystone Fields in Gibsonia, Twelve Oaks Mansion in Mars and The Atrium in Prospect all have elaborate outdoor garden/gazebo areas specifically for wedding ceremonies. 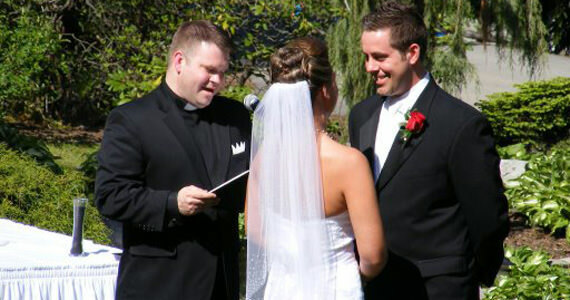 One of the wedding Officiants that I normally recommend when asked; is Reverend Mark DeNuzzio of A Simple Vow. I have worked with Reverend Mark DeNuzzio and his wife Jeanie DeNuzzio many times through the years and have always been impressed with their professionalism, attention to detail, and their ability to offer a truly custom wedding ceremony. Whether you prefer a simple civil wedding ceremony, a unique non-denominational wedding ceremony, or a more traditional celebration, they will help develop the vows and ceremony that will be just right for you. They are open to any and all ideas for how you’d like your wedding ceremony. The only limits are your own creativity. In addition to getting a wedding Officiant, when you contract with A Simple Vow to perform your wedding ceremony, you also get “Day-of-the-Ceremony Coordination” by Jeanie DeNuzzio. Jeanie is a trained bridal consultant and has proven to be a valuable asset at hundreds of weddings. From assisting with Processionals, to making sure that everyone is where they need to be – when they need to be there, Jeanie will help create a smooth flowing wedding ceremony. Your wedding day is one of the most memorable days of your life and your wedding ceremony is the most important part of your wedding day. You will want to choose your wedding Officiant wisely. I highly recommend A Simple Vow to couples looking for a Wedding Officiant in Pittsburgh and surrounding areas of Western Pennsylvania.